I hope you are ready for another special-occasion cake post! Our youngest daughter turned 3 years old in February! It was another chance for me to pull out my creative-ideas-for-cakes notebook as I wanted to make something girly and pink for her. I remember designing clothes for my barbie when I was little. I might even have sewn a few of them. But my skills were pretty lousy back then. 🙂 And lets face it, working with frosting is much easier and more fun than with fabric, thread and needle! Our daughter loves to dress up as a princess and has pretty much the whole collection of princess barbies. She didn’t mind me taking one of her dolls and using it for the cake! The result: One Happy Princess! I had this idea for a cake in my head for a while now. 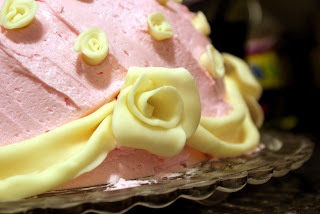 I googled out the princess cake and found a lot of inspiration, especially from this video. I baked all the layers of the cake and made the frosting. I used gel food coloring in soft pink and tinted the buttercream and the cake batter. I stacked all the layers and with a shaky steady hand – I trimmed the edges to create a dome for the gown. Then, I took a shot glass and cut out a hole in the middle of the top layer only. The doll ( without the legs ) fit perfectly inside. I filled all gaps with frosting. After a crumb coat and 30 minutes in the freezer, I applied the rest of the frosting ( reserving about 1/2 cup for the bodice ) onto the gown. The texture was created with a small spoon submerged in hot water ( that way it glides on frosting, instead of pulling it away ). 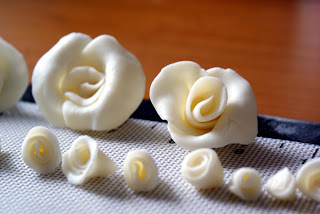 I used modeling white chocolate to make the roses and gathers of fabric for the gown and added them to the cake before the final refrigeration of the cake. I recommend making the modeling chocolate pieces the day before and storing them in the fridge, so they have time to harden. Grease and flour three 8″ round cake pans. Set aside. In a medium bowl, whisk together the dry ingredients ( flour, baking powder and salt ). Set aside. Measure out the milk and set aside, next to your dry ingredients. In a large mixing bowl, beat the butter for about a minute. Add sugar, 1/4 cup at a time. Make sure all is well combined. Add the eggs, beating well after each one. Beat in vanilla. Add the rest of ingredients, starting with the dry, alternating with milk and ending with dry ingredients. Divide equally into prepared pans. Bake 30 to 35 minutes, or until a toothpick inserted in the center of each layer comes out clean. Cool the cake in pans for few minutes, then invert onto cooling racks. Cool completely before frosting. “Fabric” gathers and roses made from modeling chocolate. The cake was delicious! I apologize for a lack of slice photo, but I totally forgot to take it during the party. I think I am going to take a break from making a special occasion, elaborate, multiple layer cakes for a while. Wow beautiful cake.Any little girl would love it. Your little princess is so lucky to have a wonderful baking mum like you. This is beautiful! You have the luckiest kids in the world! For real. This would have been my dream cake too when I was a little girl. Oh, adored Barbie and had over 50 of them! Maybe I was obsessed. I can't wait until my Anna is old enough to appreciate something this awesome…maybe birthday #2? Great job!! haha aww this cake just made me smile! Soo adorable! When I was little I always wanted the barbie cake 🙂 Your daughter's lucky to have such a good cake decorator at home! Beautiful! what more could a little girl ask for!! someone is going to be very happy about this!! Wow, CCS, you daughter is the most lucky girl in the world! The cake looks amazingly pretty!It must be a tedious works to put everything into a nice looking cake like this! Anna, this is one gorgeous cake! I love your roses…so beautiful!!! One of my best friend's mom used to make these cakes each year for her daughters…but not nearly as impressive. You rocked this one! What an incredible cake and what a lucky 3 year old! It looks brilliant, I'd have been upset to cut into it. Thanks for following me – am following back. It's a beautiful cake, Anna. Happy birthday to your lil darling! That is a beautiful cake! It is lovely, you did a great job! A special cake indeed for a special little princess! That has GOT to be the most adorable cake I've seen in a while…!!! This cake is so cute! That Princess of yours deserves every bit of it! Happy Birthday! 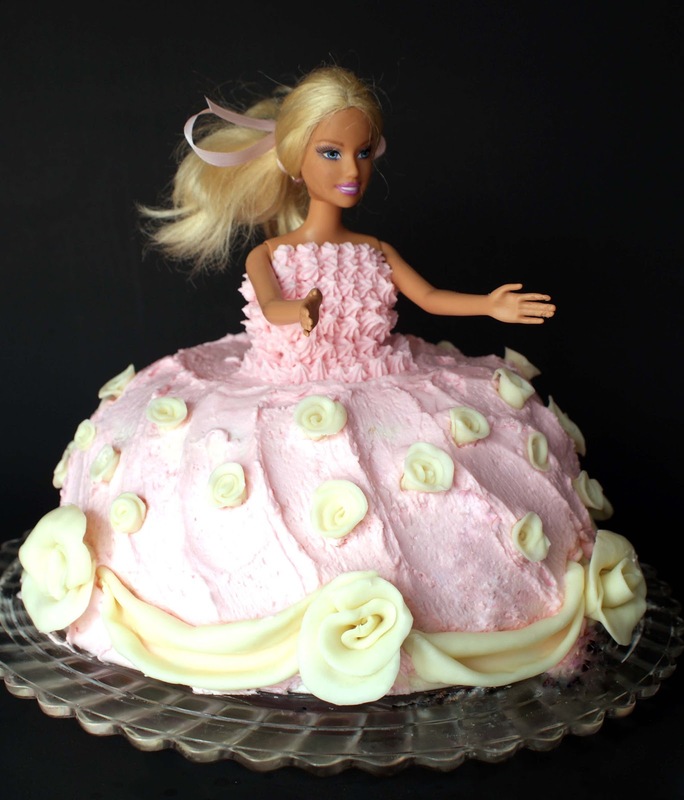 I had also made a Doll cake for my daughters and posted on my blog last year. However, I had used Wilton's Wonder Mould instead of baking and carving 3 round cakes. That is beautiful. What little girl wouldn't love a cake like that! The recipe sounds delicious. Happy birthday to your daughter! aww, this totally brings back memories for me! my mom used to make these princess doll cakes for birthdays as well! this is soooo cute and sounds delicious! A very happy birthday to your daughter–I'm sure she loved this cake! Those roses are just amazing–I wish I were better at cake decoration. I really like how you decorated this princess cake. I think the the modeled chocolate is so much better than the buttercream. The pink and the yellow really look good together. You did a wonderful job! I can tell you had fun making this and your daughter really enjoyed getting it for her birthday. Happy Birthday to your daughter! Awesome! Tell her cyberspace says happy birthday! I always wanted a cake like that when I was a little girl! Great job! I love the roses too btw… Have a wonderful week my friend! What a pretty cake! I would totally make a princess cake if I had girls. 🙂 It looks professionally done. It is so pretty…Happy Birthday to your lucky little girl. Also I hope you had a wonderful anniversary last month my hubby and I celebrated ours in February as well. 🙂 Your chocolate cake looked fantastic.